How do we affect our watersheds? What we do on the land within a watershed affects water quality and quantity! All land, no matter how large or small the parcel, is a piece of at least one watershed. Even if there is no stream or lake within sight, your land is part of this natural watershed puzzle. the quantity of the water within the watershed. As land use within a watershed changes, trees, shrubs and other plants are replaced with impervious surfaces (i.e. surfaces that do not allow precipitation to soak into the ground – roads, rooftops, parking lots, and other hard surfaces). Without plants to store water or slow the flow of surface water, the rate and volume of water moving across the surface of the land is increased. Less precipitation is able to soak into the ground because impervious cover blocks this infiltration. This means a greater volume of water travels across the land surface and reaches the waterway or stream faster. 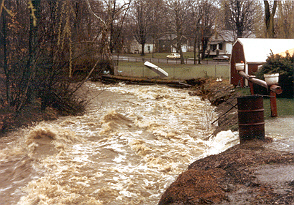 Increased volume reaching the streams and waterways can, in turn, lead to more flooding during storm events and reduced flow in streams during normal or dry periods. The reduced amount of infiltrating water can lower groundwater levels thus lowering the baseflow found in streams during times other than storm events. Reduced baseflow particularly during drier periods can stress local streams and waterways that depend on steady flows. 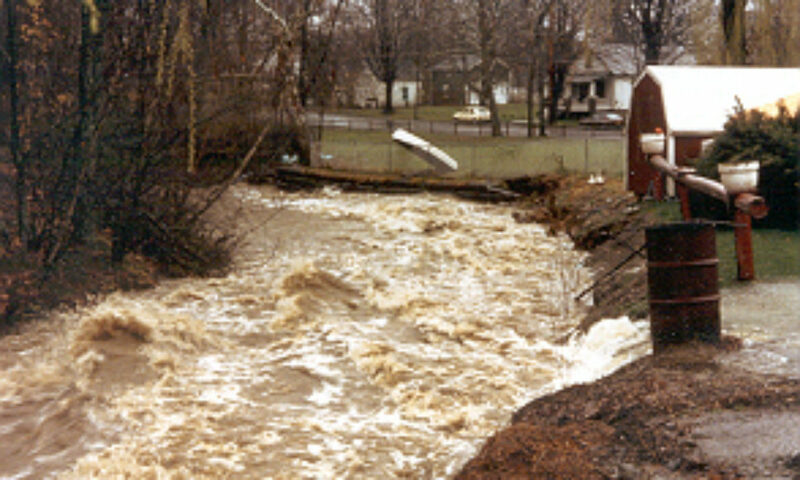 In the streams and waterways affected by the higher stormwater flows, there is a potential for erosion of stream banks and scouring of channels due to the increased volume. Sediment from eroded stream banks settles to the stream bottom degrading habitat and smothering the gills of aquatic insects such as macroinvertebrates which live part of their life cycle in this benthic freshwater environment. In addition to erosion caused by increased runoff, stormwater can carry sediments and soil particles from the land surface which contain nutrients such as nitrogen and phosphorous or contaminants which attach to the soil particles. These additional nutrients and contaminants can reach the streams and waterways in increased amounts and volumes both during storm events and in drier periods. Studies have shown that a large portion (as much as 70%) of all water pollution comes from non-point source pollution. Non-point source pollution is contamination of our groundwater and surface water that results from man’s activities; it cannot be easily pinpointed (It does not come from one “point” source such as a factory’s discharge pipe). The added nutrients and contaminants mentioned above which attach themselves to soil particles and are carried to our waterways by surface water runoff are examples of non-point source pollution. This pollution can enter the water at any stage of the water cycle through many routes including air pollution, surface runoff, or groundwater contamination. In Pike County watersheds, non-point source pollution commonly takes the form of sedimentation from soil erosion, septic tank leachate, lawn fertilizers and pesticides, road salt, motor oil and other petroleum products and stormwater runoff. Any one of these many different sources of contamination can, by itself, be a threat to water quality within the watershed. However, the cumulative effect of different sources of contamination can have a much greater impact on surface or groundwater within a watershed. Since over 98% of Pike County’s residents obtain their drinking water directly from groundwater sources and the balance of the residents obtain their water from natural springs which come from groundwater, understanding the importance of groundwater recharge, movement and potential contamination should be the responsibility of every watershed resident. As mentioned above, land use changes within a watershed can impact water quantity in surface waters such as streams during storm events and drier periods. Land use changes can also impact the quantity of groundwater reserves. Since all groundwater eventually surfaces, the water in the ground must be recharged. Most groundwater recharge occurs in the spring when there is plenty of water from rain and snow melt, plants are not actively growing and taking water from the soil, and the amount of sunlight is less so evaporation is less. Following the spring recharge, the water table usually lowers steadily during the summer, fall and winter. Groundwater recharge rates also vary with the type of land cover. For example, wetland areas provide the most opportunity for recharge of groundwater reserves. Infiltration is also high in forested areas where water can be held in pockets on the forest floor and where soil sometimes does not freeze so recharge can continue in the winter months. Land use which changes from forested and vegetated areas to impervious surfaces can dramatically reduce the groundwater recharge taking place in a watershed. Combining this reduced recharge with increasing water use by humans within households throughout the watershed and groundwater levels particularly during dry summertime periods can become critical. As you can see, what we as individuals do on the land can impact water quality and quantity. Simple changes in our daily lifestyle can make a difference in the quality and quantity of the water resources within your home watershed. Effective Watershed Stewardship begins with each individual property owner who is a part of the watershed puzzle. Everyone must acknowledge their responsibility for maintaining the integrity of their home watershed. Watershed stewardship is not really as complicated as it sounds. It starts with you, first by “knowing your watershed address” and then by looking around and learning more about the people and the impact of the varied land uses that occur within your home watershed. Changes in land use can impact the rate of overland stormwater flow and the volume of runoff reaching the stream. This, in turn, causes more severe flood events and lower baseflow during regular stream flow periods. Development within floodplains can change watershed hydrology and increase property losses during storms events. Properly installed and maintained erosion control Best Management Practices (BMPs) used during construction and earthmoving activities can help minimize soil runoff and sediment loading to streams and other waterbodies. Other site management practices such as working with the existing site topography and preserving vegetated corridors along streams (riparian buffers) and other waterbodies can provide protection from contaminants and sediment entering the water resources. 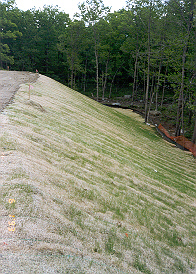 Pictured is a slope stabilized with erosion control matting.